I admit, when I read Gadgeteer reviews for the wireless charging pads, I am jealous. While I love my iPhone, I wish I could easily charge it up like the Android phones do. For an iPhone to have the same capabilities, we have to have a case, like the uNu Aero wireless charging battery case and mat. This intrigued me because it not only allows for wireless charging, but it also a battery pack built-in to give my phone extra juice when needed. The uNu case comes with a micro-USB cable, headphone extender, the case, and the charging mat. It would have been nice to have a wall adapter included, but I just used the standard Apple adapter instead. To charge the phone, you first install the case, plug the micro-USB cable into the mat, and plug it into the wall or a USB port. Once all that is done, you simply sit the phone on the mat and it starts charging immediately. All in all, it was a very simple process to set up and I instantly took a liking to charging the phone without any cables. After several days of goofing around with different positions, I found out two things. The first thing I found out was that the mat has a light magnetic charge to it, so it keeps the phone in place when I bump the mat, and the second thing I found was that it charged in all of the positions that I tried, except for one. Pretty impressive! So the wireless charging feature worked great, and was a breeze to use, so how about the case? Well, first off, this case is very lightweight for its size. I’ve reviewed a few battery cases, and this one is by far the lightest. This case was also the only one to have dedicated buttons for the volume and wake/sleep, rather than a simple cutout. 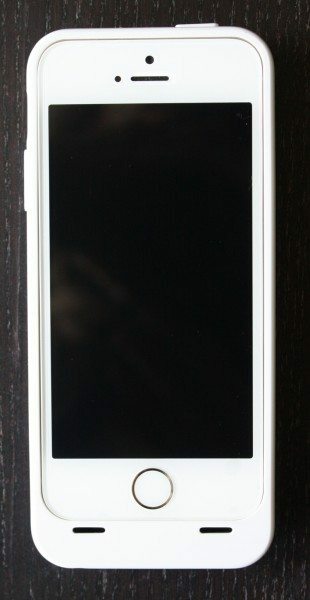 Above, you can see the side view of the case. It has a slim form factor for having a battery inside, and the volume buttons worked well. The top of the case has the wake/sleep button and that is all. One thing I disliked about this case was that the button was hard to press down. You had to press it down on the outside half (the side that is not connected to the case in the picture above) and it would work fine. If you pressed it quickly in the middle of the button, or towards the middle of the phone, it wouldn’t work without a very firm press. One of the only other problems I had with this case, was that there is no lip at all on the top. This means if you place your phone face-down, the screen will be touching the surface. My sister shattered her screen due to a case that had no lip, and when I dropped my phone with this case on from hip height, it slid across the pavement face-down, and I was thankful I had a screen protector on, because the protector was ruined due to deep scratches. The case provided protection for the drop itself, but not for my screen. On the bottom of the case you’ll find the hole for the headphone jack, a small cutout for removing the case, and a micro-USB port. The micro-USB port is so you can charge without the mat or sync on your computer. Most headphones without a thin, straight plug will need to use the included adapter. Taking the case off and putting it on was easy enough. The instructions say that when putting on the bumper part, to start at the top, and indeed, you must start at the top. I tried putting it on a different way and the top side would not click down. There are two metal conductors on the back of the case for the wireless charging mat. All you need to do is make sure both conductors touch the mat when you place the phone on, and it will start charging the case and phone. Four blue lights on the back indicate the battery level of the case. Press the button between the lights down once and it will tell you the battery level, and if you hold the button down it will start charging your phone. The phone charged up as fast as if plugged into a wall outlet, and was on par with the other battery cases I have reviewed. It will charge the phone up to full and have a little juice left to spare. A black ring is around the cutout for the camera to prevent the flash from reflecting, but the black ring is not matte, so while the flash does not reflect as badly, it is still noticeable when used in low light situations. So while the wireless charging worked easily and without a hitch, the case has a bit of work to make it more desirable. After dropping my phone on the pavement, I am quite leery of using the case for everyday use. I absolutely loved how easy it was to charge my phone, and it is a step in the right direction, but until the case adds a little more protection and fixes the flash problem, I can’t recommend it. Visit uNU for more info. 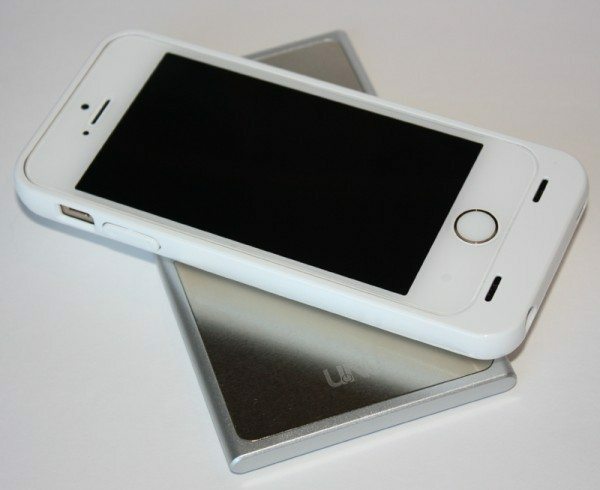 uNu Aero wireless charging battery case and mat for iPhone 5/5S review originally appeared on The Gadgeteer on May 3, 2014 at 11:00 am.